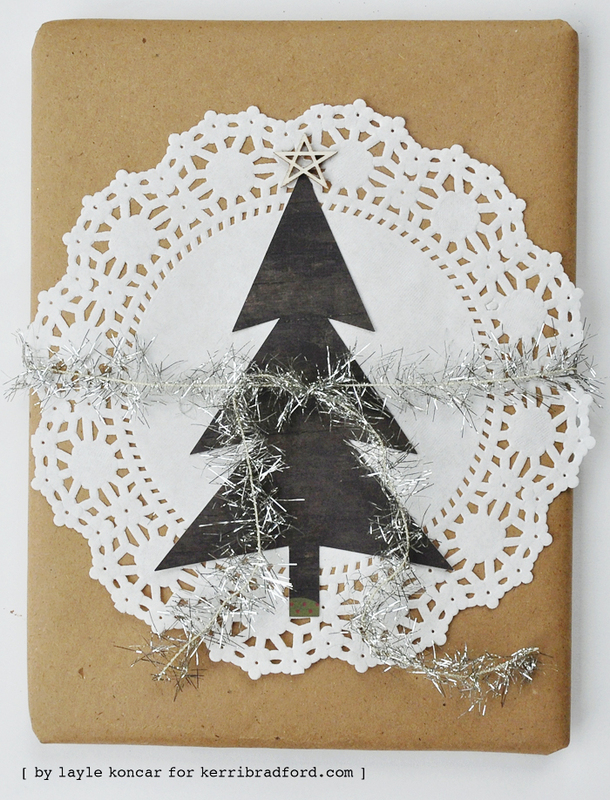 Brown Paper Packages | Christmas Style + Yet Another Giveaway! Three days in to our little Brown Paper Packages event. You know what I can’t even believe more than that? Those cute girls over at Eighteen25 shared a ‘100 Days ‘Til Christmas’ ABC Family photo on Instagram yesterday. 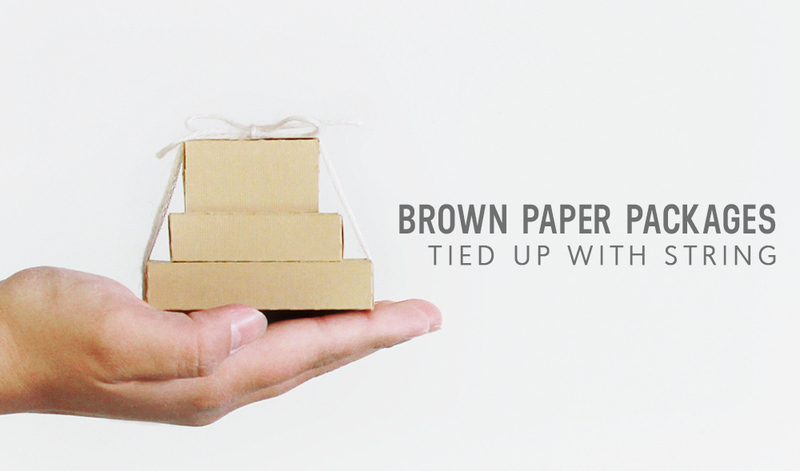 Well, this week is the perfect time to start thinking of some fun Christmas ideas in the ‘Brown Paper’ genre. Take a look at what Layle has made! Layle says: Although this deer cut file is part of the Happy Camper kit, it screamed Christmas to me, so I decided to use it for a Christmas tag. In fact, I cut the head directly on the tag itself, making the tag come together quickly. 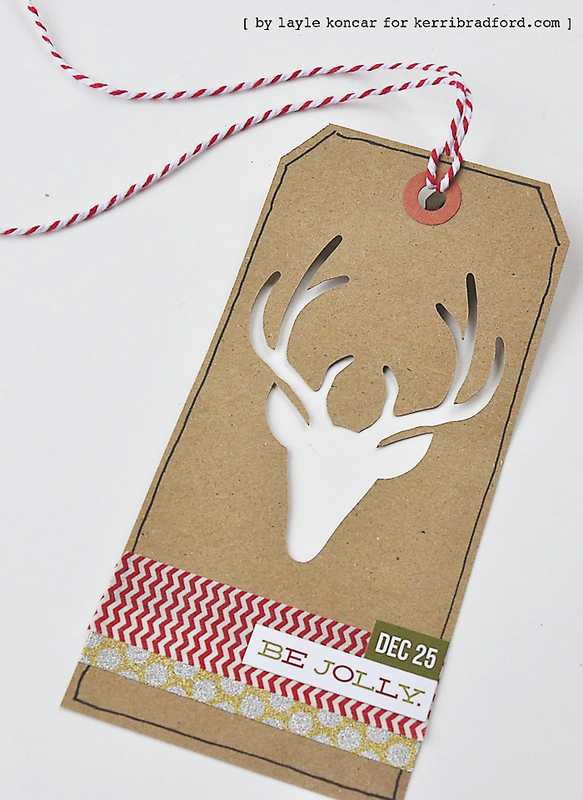 A little washi tape, Christmas stickers and red bakers twine – it really couldn’t get any easier than this! I couldn’t agree more Layle! I am in love with this tag for so many reasons. The simplicity. The negative space head. The kraft tag. It’s just wonderful! Awesome for a gift or in your Christmas album…or both. Why choose? Layle says: A neutral package and another cut file from the Happy Camper kit used for Christmas! I cut the tree from a woodgrain piece of paper, glued a doily to the top of the package, added the tree along with a wood veneer star at the top and wrapped it up (literally & figuratively!) with the tinsel trim. 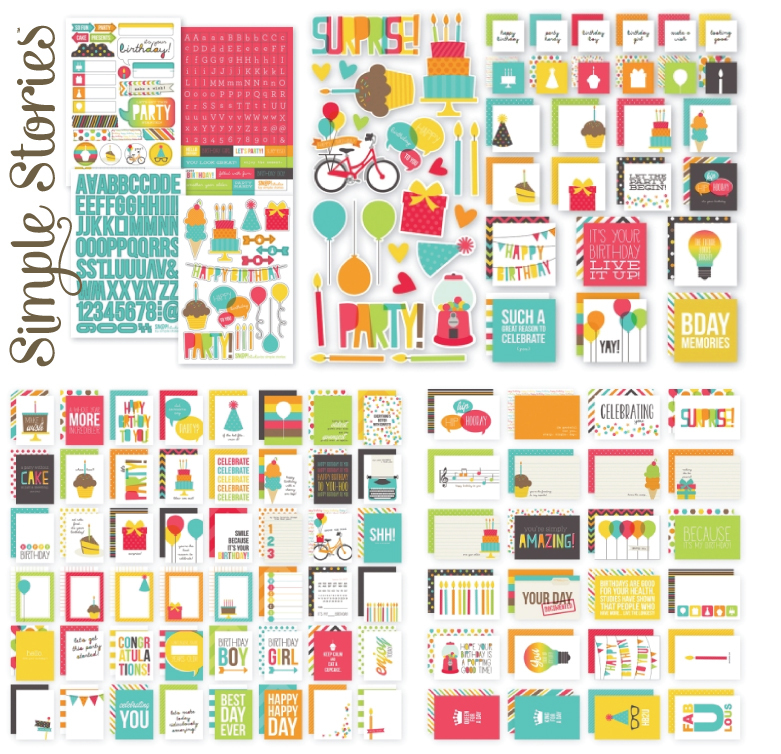 We’ve got a fabulous Birthday package from the folks at Simple Stories…and that means Layle too. :) Oodles and oodles of fun, brightly colored cards and stickers and such. Perfect for those birthday pages and pocket scrapbooking! Here’s a plethora of ways to enter. U.S. residents only please. If you haven’t had a chance to enter in the other two giveaways this week, be sure to do that. All contests will end Sunday and winners will be announced Monday. Love the tag so cute! What a great idea to cut the deer into the tag. I glued about 100 last year!! Biggest birthday surprise…well, it didn’t quite work out as planned, but I was trying to get my husband to a restaurant at a certain time to be surprised by family. A football game was on and he could not figure out why I was in such a rush to leave. Anyway, we made it and he was definitely surprised! Thanks for the fun giveaway! Love your blog!.Thank you for the chance to win!. The biggest birthday surprise is a surprise party, of course! I love that tag! Thanks for the chance to win! Love the tag and Simple Stories line! My biggest birthday surprise was for my 50th birthday. My wonderful husband planned a party and had all my family and friends there, complete with picture boards and a fabulous cake! Love the Reindeer tag!!! SO cute! The biggest surprise was a party when I turned 40…including out of state family! Thanks for the chance! I’m thinking these would be PERFECT for card making!! Such bright wonderful colors! Love them! Such a cute tag and love the package decoration as well! I’m all for simplicity and these would be so quick and easy to make, but still have a big punch! Birthday surprise? Can’t say that I recall any big “surprises.” Just happy to be able to share them with my family! What a great giveaway! Love all things ‘Simple Stories’. So easy to use all types of projects. Im seriously thinking about CASEing that tag. Love it! Love, Love, Love that tag! It is going on the definitely need to make this list. Love that tag! Definitely going on the need to make that list! Yikes, I am so not even thinking about Christmas yet!! Love the tags and the giveaway is awesome. Thanks for all the inspiration. Finding out I was pregnant! I couldn’t believe store’s here in Michigan had Halloween & Christmas items out in August. Wow! I hope you are having a GREAT birthday week. My biggest birthday surprise was my 40th birthday party thrown by my husband. Love, love the simplicity of this tag and Simple Stories!! I am a big fan of yours. Thanks for the inspiration. Happy Birthday week Kerri!! My biggest birthday surprise was a diamond heart necklace. I love it all! I hope you enjoyed your own birthday celebration yesterday! Love, love, love all the projects this week… and thank you for the giveaways too! What a wonderful tag! So creative! thanks for the chance. My biggest birthday surprise was when I was 9. My sister had made me an entire wardrobe for my doll. Beautiful clothes. Love the tag and all the projects you do. Thank you for a chance at this giveaway. Love when you can use the theme kits in different ways! Thanks for the ideas! The biggest birthday surprise…hmmm…I think it was probably me knowing my friends were going to be hiding in my room when I got home from dinner with my family on my 13th birthday. It was kind of a tradition with out friends. We would decorate each other’s rooms and hide out til they came in. I wrote a note to them that said, “Thanks for coming!” They all couldn’t believe I knew their plan. :) It was fun to surprise them. My sister and hubby threw me a surprise birthday party when I turned 25, totally not expecting that! I was turning 50 and having lunch with all my kids and this young man was our waiter. He was “firting” with me (to get a good tip. It worked), and one of my girls said, “She’s older than she looks!” We all just about laughed ourselves off the chairs. Kind of a backhanded compliment, but a lot of fun. I totally love this tag! Gonna go right out and make one/a bunch up! I always love to read your blog posts and love your work. My friends throwing me a surprise birthday party in middle school. They were great friends and middle school was hard, so I am glad that I had them. My grandson has his 3rd birthday next week, this would be perfect, thanks for the chance to win! Love the tag with the deer head. Definitely going on my to-do list. hmmm, biggest birthday surprise….I can think of biggest anniversary surprise, biggest Christmas surprise, but got nothing for biggest birthday surprise! Great tag and package! Still celebrating strong! Oops! Forgot to tell my biggest BD surprise! It was a party given by my sister last year for my 60th BD and all 3 of my grown children were there! Happy Birthday! We’re big on celebrating birthdays, but not too much on surprises. But this is great-YOU have a birthday-and WE get the surprises! Thanks for the chance! LOVE the deer tag–and the calendar tag from Monday! Thanks for the chance to win! I love Simple Stories. Another fun give away! Thanks for the chance. The biggest birthday surprise I ever got was a bouquet of 48 red roses. That would not seem surprising to most people, but if you know my husband, it certainly would. He NEVER buys flowers; occasionally plants, yes, because they “last longer”. But even for the births of our kids, he didn’t buy flowers. So it was a totally extravagant gesture on his part. I love those awesome tag ideas! Biggest surprise…. when I was little, we visited my grandparents in Santa Barbara. Went out for midnight mass on Christmas Eve, and when we arrived back at the house, Santa had come and left a lot of beautiful presents! Did not expect him to come til later in the night while we would be asleep, so that was a huge surprise! Surprising my daughter with her first car! I love making my own gift tags. These are adorable! I love the bright, fun colors of the Birthday package from Simple Stories! Ahhh….can’t think about Christmas yet, but that tag sure is precious. Had to save it as an inspiration. One of my son sent me flowers. It was such a surprise as he had never sent me flowers before and was really good at keeping it a secret. My biggest birthday surprise was when my Mom brought my Godmother up on the train to celebrate my birthday. I rarely am truly surprised so it was a great gift! My husband planned a surprise birthday party at our house with all of my friends. It was quite a surprise to walk in the front door and see our house full of all my fave people! Love this birthday week on your site and Simple Stories is fab, too! I love the inspiration-Layle projects are awesome! The giveaway is pure eye candy sugar with a cherry on top! The colors are so cheerful. I have the perfect home for the collection! I have 3 children and have years and years and years of birthday pictures to scrap. Which, brings me to a thought…your happy birthday cuts would be a perfect match! I love everything about the set. The colors are so fantastic and the bike is adorable. My biggest birthday surprise was diamond earrings on my 50th (and also the day I retired!) from my sweet husband! Great birthday celebration, love the kraft ideas! Not sure don’t get too many surprises on my birthday…although my 6 kids make it fun! Clever idea with the deer tag! Thanks for a chance to win this awesome prize! I just threw a 50th birthday party for my husband and invited 100 of our friends for a pig roast. We had a wonderful time & he was certainly surprised! My husband proposed to me on my birthday. Simple Stories is one of my fave companies. Thanks for a chance to win. Layle’s reindeer tag is simply wonderful! Best birthday surprise ever was a new car on my 17th birthday! Love the kraft tags. Washi tape and just a little to make them sparkle. :) Great ideas! My biggest birthday surprise was a new car for my 40th birthday. Completely unexpected, but we certainly needed one. When I was sixteen my mom planned a surprise party for me. All my friends squeezed into our tiny bathroom. my mom asked me to go get her a tissue and boy was I surprised when I opened the door! My “boyfriend” at the time threw me a surprise birthday party! It was so sweet but I really thought we were going to a movie!! My biggest bithday surprise: for my 21st birthday my mother made me a simple scrapbook and just after that I found out I was pregnant with my first. Hence I now scrap her and the him that followed shortly after. “What the french toast!” You crack me up Kerri. Love, love, love that reindeer tag and love Simple Stories. My biggest surprise was at my 50th birthday when I got an iPad. Usually I’m the last one in my family to get the latest and greatest iAnything. So I was shocked when they gave me the most recent version. The biggest birthday surprise I was able to pull off….told my husband that we needed to stop over at a friends house to drop something off…when we walked into the back yard all of his friends and family were there to surprise him! He had absolutely no idea, and the icing on the cake was that the children and I gifted him a set of golf clubs that he had been eyeing at the pro shop for years! He was still using the ones he had as a teenager and technology had come a long, long way! Kerri I have both a USA & Canadian address so I hope you would allow me to participate in your giveaway! Prefect for catching up on my pocket scrapbooking and making birthday cards for my daughter’s friends. My biggest birthday surprise was a trip to Disney World. Thanks for the chance to win! 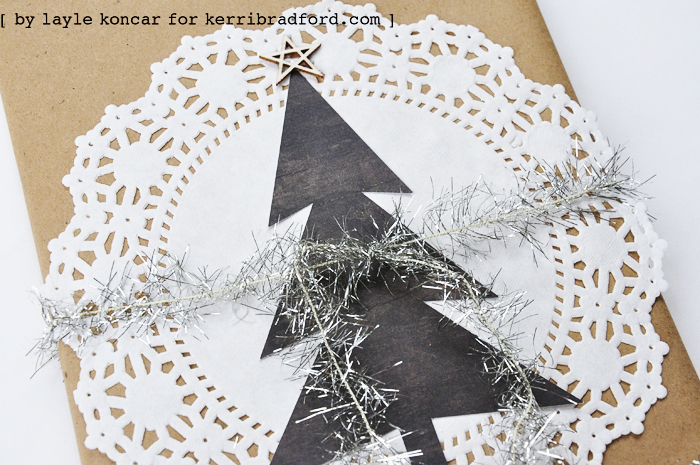 Love the tinsel, christmas tree and doily wrapping! Forgot the question… Thanks for the giveaway! Thanks for sharing. My husband threw me a 40th bday party! My biggest birthday surprise was a trip to Italy for 2.5 weeks for my 50th birthday. Wonderful tag! So awesome to have the reindeer’s head and I love the great layered parts of the tree tag! Thanks so much for sharing and inspiring! My biggest birthday surprise was many moons ago, my DH and I were out in the boat on my birthday. And he said he needed to go to the bathroom, so we were going to stop at his sister’s house…okay. As we were walking from the dock I noticed lots of familiar cars, he threw together a surprise party for me :) He’s done that many times over the years, and has always surprised me! My biggest birthday surprise was a pair of diamond earrings from my hubby! My biggest birthday has to be for my 40th birthday when my cute husband surprised me with an awesome totally surprise party !! It was so fun and he totally got me !! I’m loving the reindeer tag! My biggest surprise was recieving my cameo for my birthday last year!! Love that tag! So cute! Sadly, I can’t think of a birthday surprise! Thanks for all the fun giveaways! I love Simple Stories. can’t get enough of them! My biggest surprise was years ago on my fifth birthday. My dad was in the Air Force and had been up in Nome, AK for three weeks and wasn’t due home for another three. He switched with someone and drove 7 hours home to Anchorage in Feb. to be there for my birthday party. I had no idea he was going to be there. My biggest surprise was from my hubby. He got tickets to Michael Buble for us. He wrapped them in multiple boxes so there was no way I could guess beforehand. Surprise spur of the moment trip for my birthday to NYC and spent my birthday on top of the Empire State building at midnight! Priceless. On my 21st birthday my parents gave me a surprise party. Great tag. Got me thinking of new ways to do this cutting machine stuff!